Pioneers in the industry, we offer linked belts from India. We are remarkable entity, engaged in manufacturing, distributing, trading and supplying an excellent array of Linked Belts. The offered linked belts are designed by inculcating advanced technology and using top quality basic material keeping in mind the quality norms. Our linked belts are widely commended for its features like high durability and accurate dimensions. 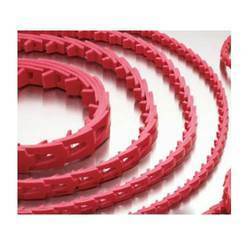 These linked belts are provided in various specifications to choose from.